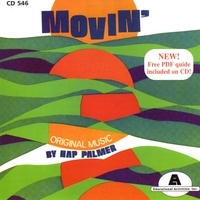 This is a richly produced collection of original instrumental music by Hap Palmer written especially for movement exploration and creative movement activities. This is a richly produced collection of original instrumental music written especially for movement exploration and creative movement activities. Top studio musicians play a variety of tempos, moods, and styles including rock, ballad, bossa nova, Dixieland, waltz, blues and jazz. Students move, explore, and create, to the sounds of real instruments including piano, flute, clarinet, trumpet, trombone, guitar, banjo, electric sitar, drums, percussion, bass, violin, cello and bass. Fabulous Cd. Music is wonderful for music recognition and fun for children of all ages. Have used this music for years to work with children that are differently abled as well as children in my regular day to day classes. Thanks Mr. Palmer. My cassette finally gave out and luckilly I found this website. Now I have a CD and the parents won't tell me I need to get with the new technology....HMMMMM! Yes, I received my CD, and love it. I am a grandmother. I did not buy this one for the children. This is for my use. I create video DVD's for family and friends of trips and events in our lives. The music is perfect for background because it is original. You don't find yourself listening to a familiar song, but rather letting the music carry you through visual media.